Or I could be the masochist and tell you that life should beat the hell out of you and then you should die. If I’m being truthful though, I’d say that there is a balance to be achieved. I have some friends who seem like they’ve been given some incredible things, much like myself, only their blessings have come in the form of opportunities. They have the jobs a lot of people would want, and are living a life that seems so over the top amazing, that one can’t help but fight off a little bit of jealousy. It all seems to have just dropped in their laps, too. I don’t fully understand it. There are others though who are in the same places, but it took them years of working two jobs while going to school, sacrificing social life and whatever other luxuries that may have come their direction to be where they are. They’re happy too, but have this way about them, they look like they’ve achieved something. They look admirable. I wonder sometimes if I’m part of the latter group, because I have worked hard to be where I am now, which in the scheme of things is practically nowhere! 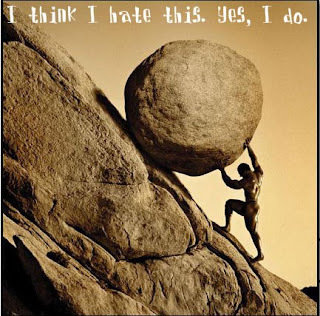 I serve coffee and go to school both more than I should be right now, and I occasionally feel like Sisyphus. Unlike that poor wretch, I know that there’s a payoff coming soon. I admire these people who work h ard, because they gain so much appreciation and understanding for what they’ve done. That isn’t saying that people can’t be given something and not understand how amazing it is, but I think there is a difference, more noticeable by those who have made the sacrifices. So I guess that we all need to work hard and put our gifts to the test, trying to become whatever we need to be, and really just live life in the process. I don’t even think that I have a point to this post, but I’m noticing some disparity, and while I would like to be on one particular side of it all, I still greatly admire the other.